Warning- this post may contain spoilers. Mr. Wuffles! 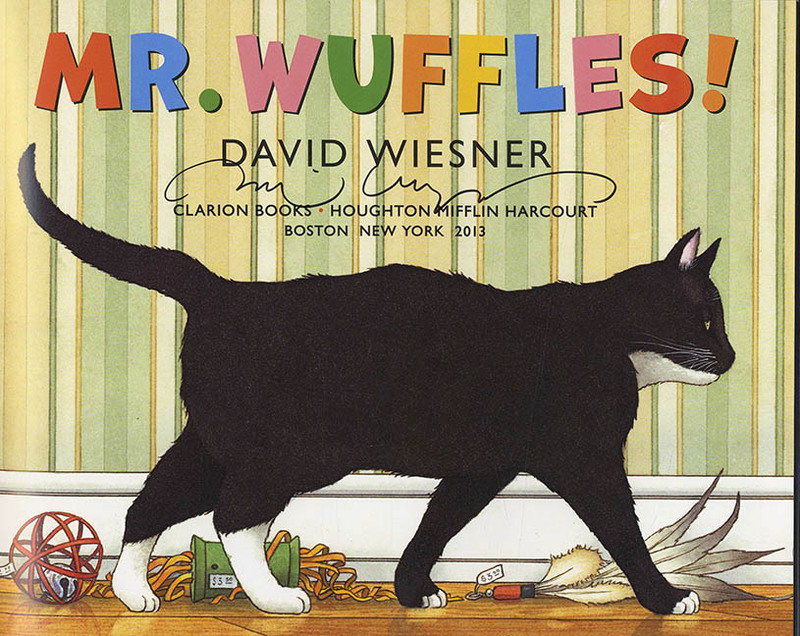 is a Caldecott Honor winning children’s book by David Wiesner. On the cover, it looks as if it is going to be about a cat. This is true, in a sense. Mr. Wuffles is a cat who has little interest in his toys, at least until a tiny alien UFO lands among them. Fascinated by them, Mr. Wuffles follows them. The rest of the book is shown through the alien’s perspective as they try to escape the curious cat. I say “shown,” as the entire story is told without the use of words. The aliens have speech bubbles, but the language within them is gibberish, allowing the reader to imagine for himself what is being said. As a small child, I liked to make up what the characters were saying in books as I could not read it for myself. This book presents the perfect opportunity to do just that. As a whole, the book provides an explanation for cats’ seemingly inexplicable obsession with whatever is under the furniture, and also entertains cat lovers like me with a near perfect representation of a cat’s behavior and posture. To see this book, and other Caldecott Honor books, browse the back wall of Juvenile awards in the Juvenile/Curriculum section of the library (Mezzanine level all the way in the back).